Product is Finished with Wilsonart High Pressure Laminate with matching 3 Mill edge. Credenza Dimensions are 72″w x 24″d x 29″h. The unit has a divider in the center with 2 adjustable shelves. 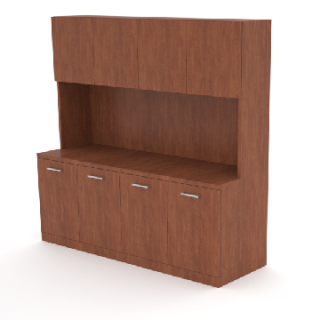 hutch is 42" high with four 18 " high Storage spaces. 23" from worksurface to underside of hutch.